Working Hands is a concentrated hand cream by Okeeffe’s that provides relief for very dry, cracked hands that are weathered by manual labor. Plumbers, nurses, mechanics, contractors, firefighters, doctors, construction workers, teachers, retail workers and many other people who work with their hands day in and day out to complete tasks need a hand cream that will help soften their skin. Working Hands is a heavy duty hand cream that provides guaranteed relief for dry, cracked hands. The hand cream is clinically proven to boost moisture levels after use, prevent further moisture loss, create a protective layer on the skin's surface, and help your skin feel hydrated and softer within days of use. 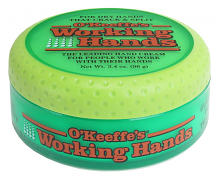 Learn more about O'Keeffe's Working Hands or save and print or email a PDF about the product in our blog post.